This Interview date is April 26, 2016 at 14:00 - 16:00 local time. Rob Whiteley, Director of Marketing, discusses how Hedvig is contributing to OpenStack as well as where they see adoption of the technology headed in the future. 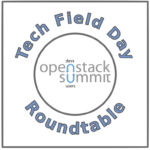 He is interviewed by Stephen Foskett, organizer of Tech Field Day. Pino de Candia, CTO, discusses the networking benefits that Midokura brings to OpenStack and talks about how the project is starting to make inroads in the enterprise. He is interviewed by Tom Hollingsworth, organizer of Networking Field Day. JR Rivers, Co-Founder and CTO, discusses how Cumulus Networks has a unique approach to networking and how it integrates with OpenStack and provides users with increased functionality. He is interviewed by Tom Hollingsworth, organizer of Networking Field Day. Marc Fleischmann, CEO and Co-Founder, introduces Datera and talks about their contributions to the Linux storage system as well as OpenStack. He is interviewed by Stephen Foskett, organizer of Tech Field Day. Madeira Maskasky, Co-Founder and VP of Product, discusses how Platform9 is increasing OpenStack adoption by providing a service solution that allows companies to get up and running on the software in a minimal amount of time. She is interviewed by Stephen Foskett, organizer of Tech Field Day. Arvind Soni, OpenStack Lead Project Manager, discusses the benefits of running OpenStack on VMware and how the project can be integrated into an existing VMware environment with ease. He is interviewed by Tom Hollingsworth, organizer of Networking Field Day. Ashish Shah, Director of Product Management, introduces AVI Networks and discusses their load balancing solution for OpenStack as well as highlighting the ease of use and deployment of the solution. He is interviewed by Tom Hollingsworth, organizer of Networking Field Day.